A point of pride for the Great Lake State, Michigan’s west coast is an incredible fruit belt. It’s hard to believe that those Winter storms blowing in from Lake Michigan help to create a climate that’s perfect for growing a variety of fruit. Of all the fruit grown, however, the one that I most anticipate is the tart cherry. Depending upon the weather each Spring, these cherries come into season sometime during the latter half of June and last but a few weeks. Now that doesn’t leave me much time to get my share. In years past, I’ve detoured while traveling to, or from, a visit home; I’ve made “cherry runs,” driving 2 1/2 hours each way to get to just the right farm; or the Fates have smiled upon me and I’ve come across some at one of our farmers’ markets — like this year. As thrilled as I am to be able to buy some without a long drive, I must say, buying directly from the farm does have its advantages. Not only are they less than half the price, but many farms sell them pitted and frozen, as well as whole. In one trip, I can get enough cherries for a couple of pies and a few batches of muffins, with nary a pit to be found. This recipe was in a book of recipes Mom assembled for me after I moved to Chicago. She and her Sister, Zia, both gave me recipe books and I often refer to them. In fact, quite a few of the recipes already in this blog, and many more to come, are from those 2 books. The thing is, this recipe was not a part of the book; it was on an index card stuck within its pages. As a result, I have no idea where it actually came from or who gave it to me. As far as muffin recipes go, it’s pretty basic. It does, however, include an optional topping made of flour, butter, and sugar. Though not necessary, it does add a nice element to each muffin top. All facts considered, the only real problem I have with this recipe is that a dozen muffins, even if small, are a few too many for me, being I live alone. So, I’ll drop a few off with friends and freeze the rest. These freeze well and nothing starts the day off better than doing so with a home-made muffin. But what if cherry muffins do nothing for you? Then I suggest you check out this recipe for Blackberry Jam Muffins over at Katherine & Greg’s blog, Rufus’ Food and Spirits Guide. Not only is it a good recipe but theirs is a great blog to follow. Pre-heat oven to 375*. Either spray muffin tin with cooking spray or place one liner in each cup. In a large mixing bowl, whisk together flour, baking powder, salt, cinnamon, and sugar. In a separate bowl, combine egg, almond extract, vegetable oil, and milk. Add wet ingredients to dry and barely mix before adding the cherries. Mix entire batter until just combined. Batter should be lumpy. Muffins will be too dense if batter is over-mixed. Use an ice cream scoop or large spoon to fill each of 12 muffin cups equally. If topping is desired: Using a fork, combine the flour, butter, and sugar to create a crumble topping. Sprinkle an equal amount on top of each of the filled muffin cups. Bake until golden or the muffins pass the clean toothpick test, about 20 – 25 minutes. Allow to cool at least 5 minutes before removing from pan to cool further on a rack. As you can see, this recipe doesn’t rely upon a lot of sugar. I don’t want sugar to take away from the tartness of the cherries. Since I didn’t create the topping for this batch, I did, however, give each muffin a very light sprinkle of sugar. While it won’t detract from the cherries, a light dusting of sugar will help to crisp the muffin top. And when you’re preparing the cherries, chop them by hand and not in a food processor. I’ve found that no matter how hard I try, a food processor over-chops the fruit. By using a large knife to roughly chop the cherries, you’ll end up with flavorful muffins containing large pieces of fruit. This entry was posted in Sweets (Dolci), Vegetarian and tagged Baking, Food, Muffins, Recipes, Tart Cherries by ChgoJohn. Bookmark the permalink. Those muffins look fabulous. Driving 2.5 hours for those cherries seems rational to me! Thanks for the shout out and the kind words. I always love coming here, such wonderful family recipes. Thanks, Greg. The shout out is well-deserved. I really do enjoy checking your blog daily just to see what you & Katherine have cooked up for us. I’ve recommended it to a number of friends and they’re all equally impressed. Do you have a Gluten Free old world recipe? Sorry, but I currently do not have any gluten-free muffin recipes. There are quite a few blogs that deal with a gluten-free lifestyle, right here on WordPress. You can start your search by going here: http://en.wordpress.com/tag/gluten-free/ . Thanks for stopping by. 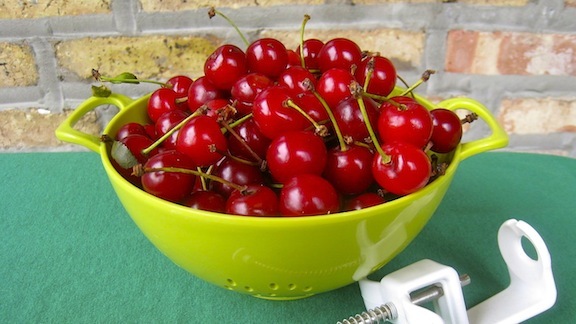 My father loved cherries, so over the years I collected lots of cherry recipes to make for him! He would have probably driven that far to get to the farm!! I believe it was Michigan cherries we were eating in Ohio. This is a really good recipe, I don’t like anything overly sweet and glad that you allowed the tartness to shine through. I do agree, Katherine and Greg make a good team blog!! Your Dad and I would’ve gotten along just fine! We could’ve carpooled to the orchards. Yours is a great blog, too. That cheesecake recipe you posted today is just too much for words! You are obviously an accomplished baker and your Dad must’ve loved the cherried delights you prepared for him. I just received a hefty amount of cherries from my CSA and this recipe sounds like a perfect compliment to my morning cup of joe that I’m drinking now. Off to the kitchen. Many thanks! And I just got back from the farmers’ market where I bought another 2 quarts of cherries. I’ll spend the afternoon pitting them and then it’s off to the freezer. But first, I’m going to follow your lead and have a muffin with my coffee. Buon appetito! So that’s what you were doing with all the cherries. I don’t bake often, but these glistening orbs of summer would definately make it worthwhile! Nice work! Well, yesterday I was at the Evanston farmers’ market and earlier this morning at Skokies’s and, yes, I bought 2 more quarts at each market. It’s a sickness and if I were in Hollywood I’d probably enter rehab of some sort. On the other hand, my freezer is well-stocked with tart cherries and I’ll be enjoying them well into Fall — I hope. I never thought Chicago had great cherries. Your post is lovely, full of family memories. 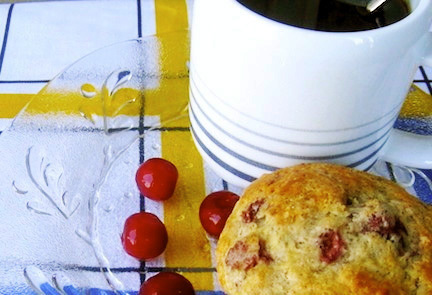 I love these cherry muffins..they looks delicious!! And I agree with you, Greg’s blog is awesome!!! Thank you for your kind words. I’ve always loved muffins and pies made from tart cherries and it’s a shame that their season comes and goes so quickly. Fortunately, I was able to freeze a couple quarts so I’ll be able to feed my addiction for at least a little while longer. I have tasted these muffins and they are fabulous. Who doesn’t love muffins! These are great. Thank you, Chris, and thanks for stopping by and taking time to comment.